Economic activity surprised on the upside in the third quarter with the government reporting the economy grew 5.0%, at a seasonally adjusted annual rate, and rose 2.7% year over year. Inflation moved in the opposite direction, plunging 0.3% in November as energy prices dropped 3.8%. Consumer prices rose only 1.3% during the last year, below the Federal Reserves’ 2.0% inflation target. The unemployment rate was unchanged in November at 5.8%, despite the economy adding 353,000 jobs. The stage is set for economic growth to exceed 3% in 2015 and the economy to generate over 250,000 new jobs each month. This will put upward pressure on wages later in the year. The Federal Reserve will therefore seriously consider raising short-term interest rates sometime in the second half, albeit at a significantly slower pace than previous rate-tightening cycles in 1994 and 2004. During November credit union members borrowed and spent, credit unions recapitalized, inflation dropped, the labor market strengthened and economic growth accelerated. 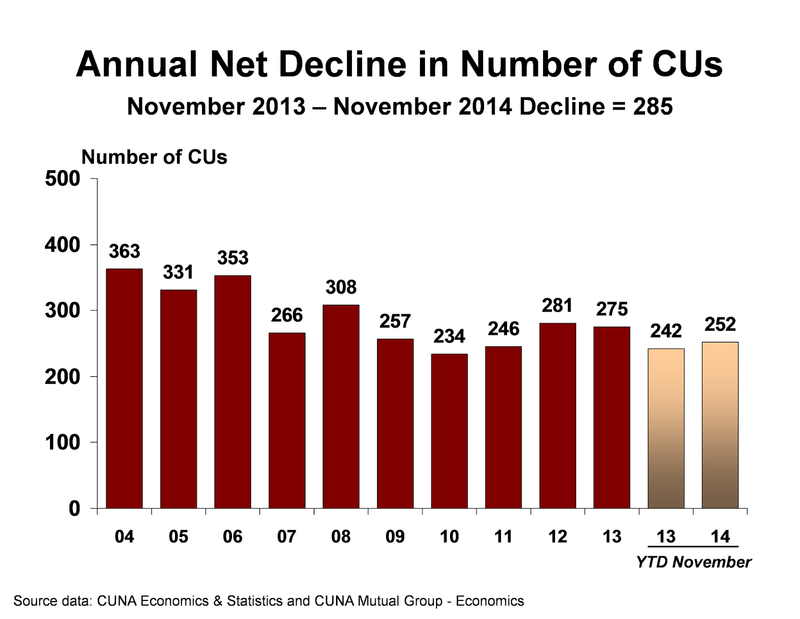 At the end of November, CUNA’s monthly estimates reported 6,543 CUs in operation, down 42 CUs from one month earlier. Year to date the number of credit unions declined by 252, above the 242 lost in the first 11 months of 2013.
Credit union savings balances fell 0.1% in November, but rose 4.2% from one year ago. Year-over-year asset growth of 5.2% is outpacing savings growth due to borrowings rising 16% and capital rising 10%. The nation’s CUs increased their loan portfolios 0.6% in November, a slight acceleration relative to the 0.5% pace set in November of 2013. Loan balances rose 10.5 during the last 12 months, the fastest pace since January 2006.
Credit union memberships rose 303,000 in November to reach 101.9 million, a 0.3% increase from October, and 3.6% year to date. Year-over-year, memberships are up 3.9%, the fastest pace since June 2003 when the economy was recovering from the 2001 recession. 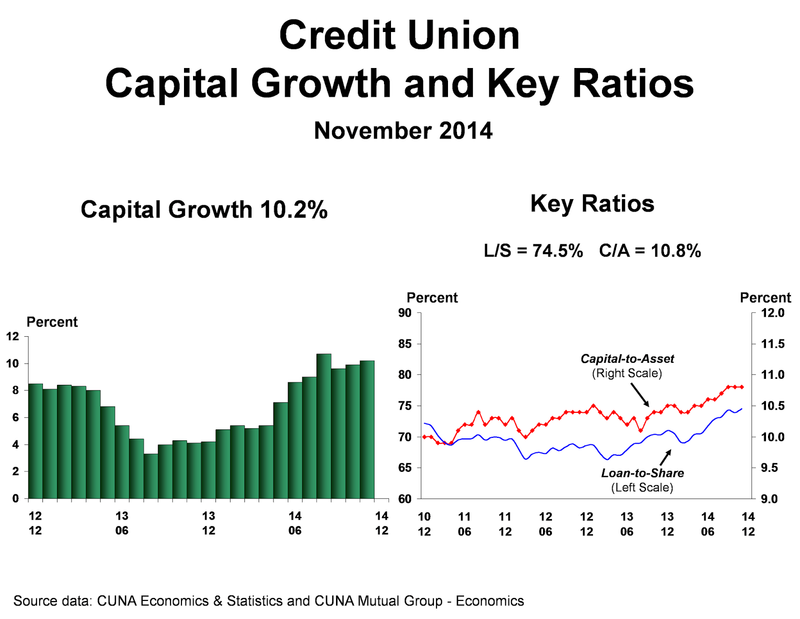 Credit union capital grew 0.7% in November to help push the movement’s overall capital-to-asset ratio over 10.8%. Credit union loan delinquency rates fell to 0.77% in November, down from 1.03% set in November 2013. Credit union loan-to-share ratios reached a new cyclical high in November, breaching 74.5%, the highest since November 2010. This improved credit union bottom lines in 2014 and will continue to do so into the new year. Credit union loan balances rose 0.6% in November, slightly better than the 0.5% pace reported in November 2013, and rose a strong 10.5% during the last year. With loan growth exceeding savings growth since March 2013, the credit union movement’s loan-to-share ratio reached 74.5%, up from a 66.3% cyclical low set in March 2013. 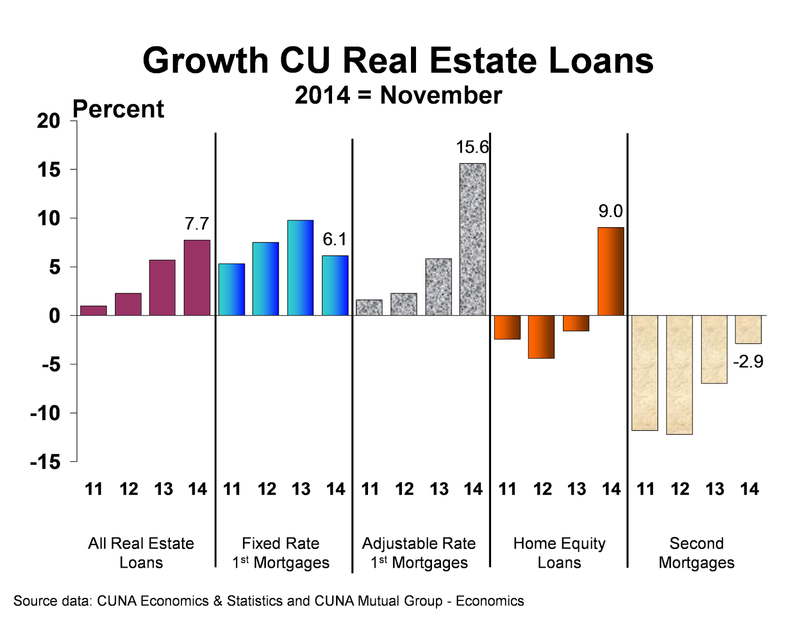 This shift toward loans pushed CU yield-on-asset ratios to 3.4% in the third quarter from 3.33% in the second. U.S. Households’ debt burden, measured by total-debt-to-disposable-income, fell to 97% in the third quarter of 2014, the lowest level since the third quarter of 2002, and down from the 124% record high set in the fourth quarter of 2007. The deleveraging phase of the business cycle appears to be coming to an end. So if households can keep their total debt growth rate less than or equal to the growth rate in disposable income, debt burdens will remain manageable. 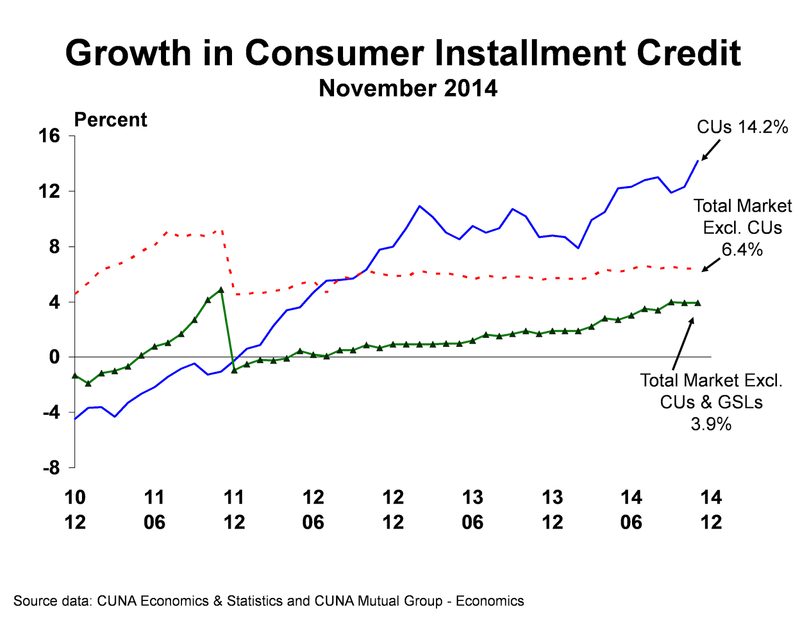 Credit unions’ consumer installment credit balances rose a robust 1.0% in November, or $3.1 billion, significantly above the 0.3% gain, ($0.6 billion) reported in November 2013. The surge in debt corresponded with a strong 0.7% growth in total retail sales in November. Retail sales were 5.1% above their year-ago level, the strongest growth since July 2013. Rising confidence, jobs, wages, wealth and real purchasing power drove the spending spree. During the last 12 months, credit union consumer installment credit balances rose a remarkable 14.2%, the fastest pace since July 1995. Excluding credit unions and guaranteed student loans from the aggregate consumer loan data reveals the consumer loan performance in the banking arena. We see bank balances are increasing at a modest 3.9% pace. 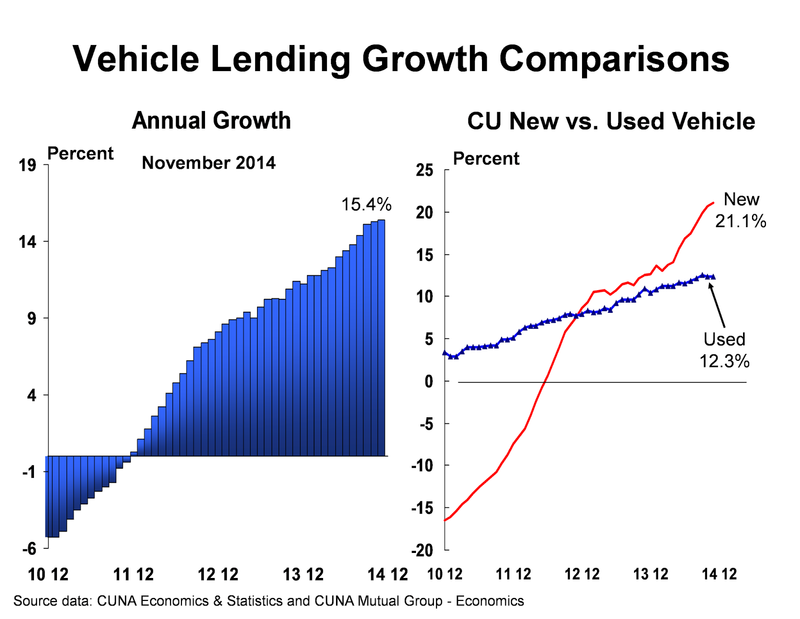 Credit union auto lending remains a bright spot with balances rising 0.8% in November, greater than the 0.7% reported in November 2013. Vehicle sales (cars and light trucks) rose to 17.2 million units on a seasonally adjusted annual rate in November, the second strongest month of the year, and up 5.6% year over year. Improving consumer fundamentals drove the strong sales number: strong job growth, improving household wealth, subprime borrowers with greater access to credit, falling gasoline prices, attractive discounting offers and favorable lending terms. During the last 12 months, credit union auto loan balances rose 15.4%, the fastest pace since May 2000.
Credit union new auto loan rates continue to beat bank loan rates by over one percentage point. Currently, credit union 5-year new-auto loan rates average 2.62%, 117 basis points below the bank average of 3.79%, according to data gathered by Informa Research Services. Expect auto lending to remain strong in 2015 as vehicle sales are expected to approach 17 million units due to the economy and labor market picking up momentum. Credit union first mortgage loan balances rose 0.5% in November, faster than the 0.3% reported in November 2013, as credit unions continue to pick up a greater share of the mortgage market and fewer originations were sold into the secondary market. Credit unions now make up 7.9% of all U.S. first mortgage originations, up from a 2.5% average prior to the Great Recession. During the last 12 months, first mortgage balances rose 8.8% due to a 15.6% rise in adjustable-rate mortgages and a 6.1% gain in fixed-rate mortgages. Notwithstanding the rising loan balances, first mortgage loan originations were down 30% during the first 9-months of 2014 compared to 2013. Credit unions originated only $68.7 billion from January through September and sold $22.4 billion to buyers in the secondary market. And of the $68.7 billion originated 62% were fixed-rate loans, 16% were adjustable-rate loans and the remaining 22% were balloon or hybrid loans. During the similar period in 2013, credit unions originated $98.1 billion and sold $47.2 billion. Of those loans originated 78% were fixed-rate due to the record low interest-rate environment at the time. First mortgage credit quality improved significantly over the last year as measured by delinquency rates falling from 1.28% in the third quarter of last year to 0.96% today. Moreover, first mortgage charge offs fell from 0.20% to 0.11%, although this is still greater than the 0.02% reported in 2006. Improving credit quality will encourage credit unions to loosen their underwriting standards as well as hold more of the loans originated on the balance sheet. Home equity loan balances rose 0.5% in November, a significant turnaround compared to the 0.5% decline reported in November 2013. Home equity loan balances are up 9% during the past 12 months due to a 5% rise in home prices, the improving job market, rising consumer confidence, consumers releasing pent up demand for durable goods, and lower interest rates. Second mortgage loan balances, however, declined 2.9% during the last year as repayments, prepayments and chargeoffs exceeded new loan originations. Members continue to roll their second mortgage balances into their refinanced first mortgage as they take advantage of these low mortgage interest rates. Credit union surplus funds fell 1.4% in November, or $5.4 billion, in order to fund a 0.6% increase in loan balances, $4.3 billion and to meet member deposit withdrawals of $1.3 billion. Surplus funds as a percent of assets now stand at 32.6%, down from 36.1% in November 2013. This shift in the mix of credit union assets from low-yield investments to higher-yielding loans contributed to the increase in credit union asset yields over the last year. The composition of surplus funds for the average credit union is 24% cash (cash on hand, deposits at corporate credit union or deposits in other financial institutions) 51% in investments of federal agency securities (obligations of Fannie Mae and Freddie Mac) 12% in CDs at commercial banks and S&Ls, 3% in obligations of U.S. government securities and the remaining 10% in other investments. The Great Recession and the associated corporate credit union goings-on caused a tectonic shift in the composition of surplus funds. In 2007, credit unions held approximately 33% of their surplus funds in shares/deposits at corporate credit unions. Today, only 5.6% of cash and investments are held at corporate CUs. Credit union savings balances fell 0.1% in November, as the excess funds that were deposited in October, due to the month ending on a payroll Friday, were used for monthly expense payments in November. U.S. personal income rose 0.4% in November and is up 4.2% during the last 12 months. With personal spending up a strong 0.6% in November, the national savings rate fell to 4.4%, the lowest rate this year. 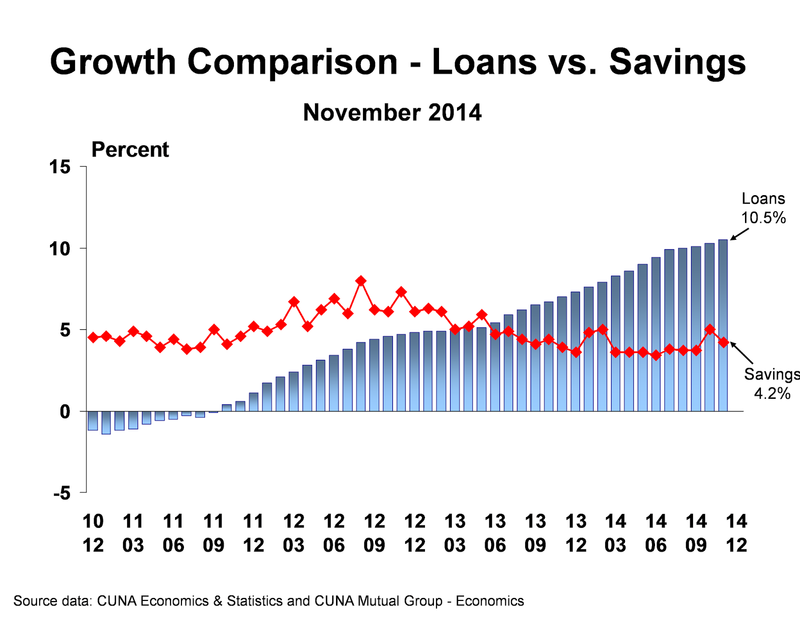 During the last 12 months, credit union savings balances rose only 4.2%, below the 10-year average growth rate of 5.5%. Year-over-year asset growth of 5.2% is outpacing savings growth due to borrowings rising 16.2% and capital rising 10.2%. Credit union capital grew 0.7% in November, pushing the credit union average capital-to-asset ratio over 10.8%, creating fortress like balance sheets for many credit unions. During the last 12 months, credit union capital grew 10.2%, the fastest pace since April 2003. The growth rate of capital is also known as the return-on-capital ratio, a key indicator of financial performance. Expect earnings performance to improve in 2015, pushing the capital ratio over 11.3%. Credit union loan quality indicators are now back to pre-recession levels. The CU loan delinquency rate (loans two or more months delinquent as a percent of total loans outstanding) fell to 0.77% in November, from 1.03% in November 2013 and approximately equal to the 2007 average delinquency rate of 0.76%. Better credit quality numbers are encouraging credit unions and banks alike to loosen their loan underwriting standards and increase their loan volumes. 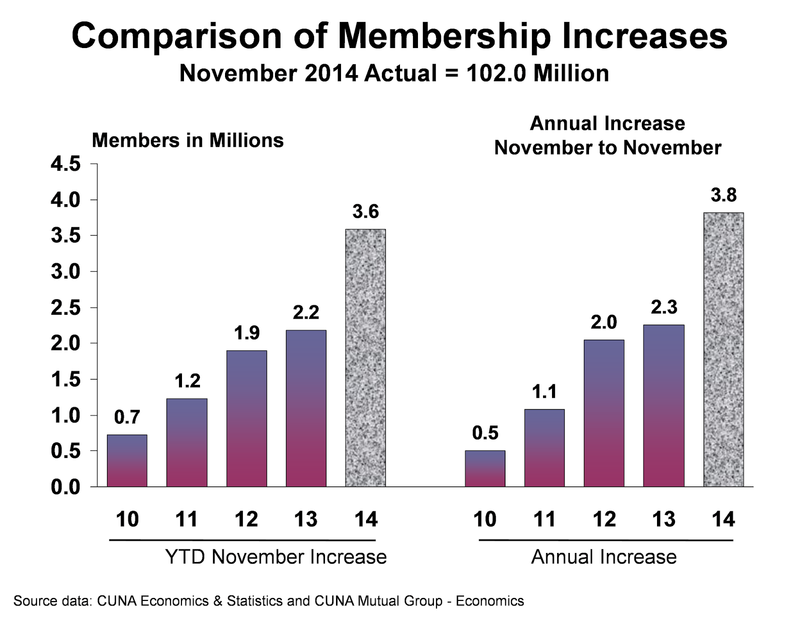 As of November 2014, CUNA estimates 6,543 credit unions were in operation, 42 fewer than October. Using a 3-month moving average to smooth out large month-to-month volatility shows an average loss of 37 credit unions per month. Credit unions cease to exist for a number of reasons – merger, purchase and assumption, or liquidation. The vast majority cease to exist as the result of a merger with another credit union. NCUA data shows 182 credit unions merged during the first 9 months of 2014, down slightly from 195 mergers during the similar time period in 2013. Year-to-date, the number of credit unions fell 252, slightly above the 242 credit union decline reported in 2013.
Credit unions added another 303,000 memberships in November, bringing the year-to-date increase up to 3.6 million members. Credit unions were attracting members at a record pace during the first 11 months of 2014, averaging over 325,000 new memberships per month. In percentage terms, credit union memberships rose 0.3% in November, 3.6% year-to-date and 3.9% during the last year, the fastest annual pace since June 2003. There is a confluence of factors bringing about this membership surge: robust job growth, strong new auto sales, aggressive credit union auto pricing relative to banks, an increase in credit demand by the general public and relatively tight bank loan underwriting standards. Credit union membership growth is positively correlated with U.S. job growth and in November, the U.S. economy added 353,000 jobs, exceeding most economists’ expectations. 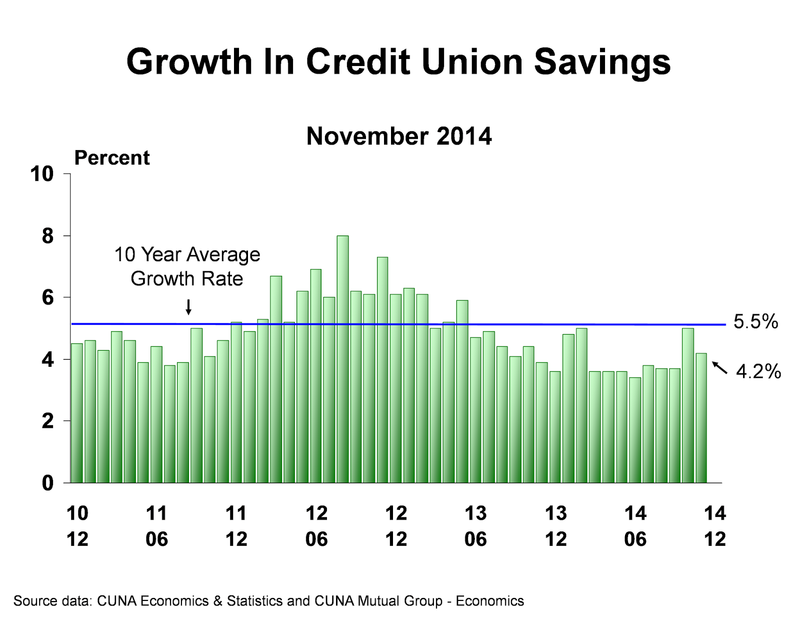 With job gains expected to remain robust in 2015, credit unions can expect another year of strong membership growth.